Kraig Kahler and attorney Amanda Vogelsberg confer during defense testimony Monday. The defense rested their case Friday, shortly before the jury returned a verdict of guilty on all counts. 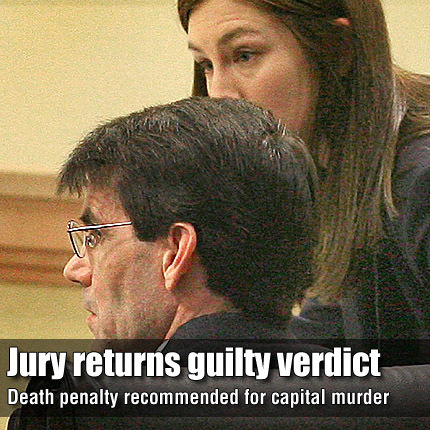 UPDATE: Just after 3 p.m. Thursday, the jury delivered a verdict of guilty on all counts. The jury heard testimony and closing statements Monday, and after 55 minutes of deliberation, recommended James Kraig Kahler receive the death penalty. LYNDON—A forensic psychiatrist told jurors on Tuesday afternoon that capital murder defendant James Kraig Kahler was suffering from a major depression when he allegedly shot and killed his wife, two daughters and his wife’s grandmother in November 2009. James Kraig Kahler is on trial in Osage County for the shooting deaths of his wife, Karen, 44, his two daughters, Emily, 18, and Lauren, 16, and his wife’s grandmother, Dorothy Wight, 89. The killings took place at Wight’s home in Burlingame. Stephen Peterson, hired by Kahler’s defense team, said Kahler’s actions that night came about because he was suffering from a mental illness. He was suffering, and still is, from a major depression, he said. During cross-examination by prosecutors, Peterson said, “He was able to shoot them, and efficiently. He went there under the umbrella of mental illness.” Peterson said he does not consider Kahler to be psychotic. However, his capability to make decisions was “seriously” degraded. While being questioned by Topeka defense attorney Tom Haney, Peterson said he met with Kahler seven times throughout the evaluation process, saying Kahler is suffering from a severe, major depression,” which he referred to as a “major mental illness.” Peterson said he found no evidence that Kahler had undergone any prior psychological testing. Before his marriage began to crumble, Kahler was functioning “well,” Peterson testified. Later, Kahler’s emotions began to deteriorate while trying to understand the complexities of the divorce.